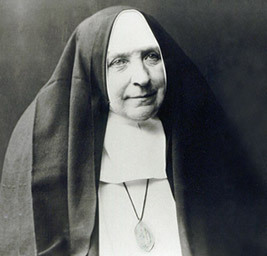 The Congregation of the Sisters of the Poor Child Jesus was founded by Clare Fey in Germany in 1844. Its original purpose was to provide care and education for the many children of Aachen who were growing up on the streets, undernourished and neglected. Clare’s mission was rooted in prayer and union with God and she developed a way of life which she called “The Practice of Walking in the Presence of God”. This is her charism. The words of Jesus “Remain in me” (Jn.15,4) are the well-spring of her Practice and of the spirit of the congregation. Today Clare Fey’s Sisters live and work in several countries in Europe, Asia and South America. In common with most other European countries, the number of Sisters in England is now greatly reduced. They run a retreat centre in Southam and are engaged in parish and other pastoral work. They also continue to support ministries with which they have been associated, including St. Michael’s school. They do this by their continued involvement where appropriate, and by their lives of prayer and witness. The Trusteeship of St. Michael’s remains under the control of the Sisters. The approval of the Superior or her delegated representative is required for the appointment of trustees.